Milk’s favorite beer? While it’s probably not recommended to dunk your cookies in, Richmond, Va.’s The Veil Brewing Company now has a seven-percent chocolate milk stout that’s been fermented in hundreds of pounds of Oreos. 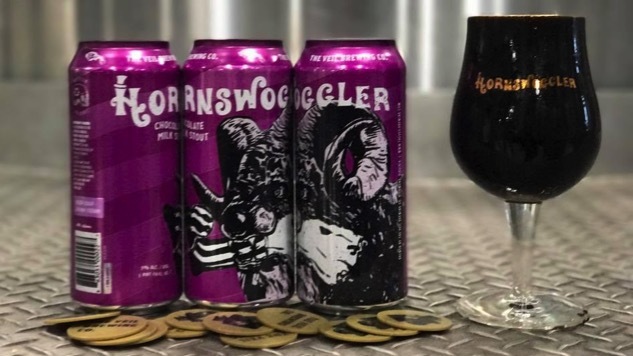 Calling it “Hornswoggler,” The Veil Brewing Co. released 60 to 80 cases of the beer made with America’s favorite cookie on Jan. 24, and it almost instantly sold out, though the brewery is still promoting an on-draft version of the drink. In either form, the brewery recommends to drink the beer cold and fresh because it contains fermentable sugars. The company hasn’t mentioned any plans to brew more of the stuff yet, and for now the beer is only in original Oreo flavor. Maybe eventually we’ll get a “Double Stuf” Oreo stout? Possibly a “Golden Creme” variety? As long as the “Watermelon Oreo” isn’t revived. No amount of hops can make that one palatable. Get a closer look at Veil Brewing’s creation below.